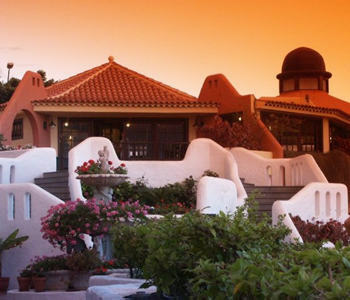 The DREAM HOTEL - APARTMENTS VILLA TAGORO is a charming village made for family dreams; situated in the residential area of Torviscas Alto; at a walking distance from a water park, it offers a free shuttle-bus service every 45 minutes to the nearby beaches and city centre. This typical Canarian style Village offers different swimming pools to enjoy the sunshine, a pool bar where you can get drinks, ice creams or snacks. And for a delicious gastronomic experience, the buffet restaurant offers different thematic meals every day, which will just delight your taste. If you are looking for fun, our entertainment team will make your holiday unforgettable by offering a wide diversity of activities. The DREAM HOTEL - APARTMENTS VILLA TAGORO is a marvellous place to enjoy with your family and friends and to feel happy with the ones you care for! From Reina Sofía - South Airport it is at a distance of 15 min. by car and 25 min. by bus. From Los Rodeos - North Airport it is at a distance of 65 min. by car and 90 min. by bus. This Village offers you 205 fully equipped apartments, decorated in warm colours and wood furniture; all of them equipped with direct dial telephone for calls, air conditioning, interactive satellite TV, security safe rental, piped music, mini bar, bathroom with shower - bathtub and hair-dryer. All of them are spacious and comfortable and will guarantee a pleasant stay. Each apartment features a large living space. As you walk in you will find the living room and kitchenette, all decorated in wood and warm colours. Next to it is the bedroom with a twin bed with closet and a mirror set. The apartment offers a nice terrace. 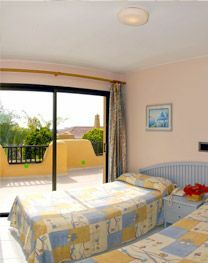 Located on the top floor with a large terrace of 45 square meters with sun beds, this Superior apt. offers a nice jacuzzi in the bathroom; a living room with a sofa bed, separated form the bedroom, a kitchenette and all the modern commodities for a wonderful stay. VILLA TAGORO offers a delicious buffet for breakfast, lunch and dinner, with a large variety of tasty specialities featuring vegetables, pasta, chicken, meat, seafood and green salads; starters include roast baron of beef, chicken and garden-fresh vegetables and much more... And wait untill you see our sinfully tempting dessert buffet! Besides Villa Tagoro's regular meal plan is ALL INCLUSIVE, to delight any taste and enjoy a simply fabulous holiday! There are also two Bars for different occasions. Located on the main terrace of the hotel, the Tagoro Buffet Restaurant offers a delicious "show cooking" buffet for breakfast, lunch and dinner! In the morning there is an international breakfast choice providing everything that you expect for a perfect morning meal. At lunch time there are a variety of internationl dishes, and at dinner time our "show cooking" corner offers different thematic buffets with Italian, Spanish, Mexican and Canarian specialities. All in a modern dining room, air-conditioned and well furnished to enjoy a perfect meal. Take a seat at the pool bar, relax and enjoy a cocktail under the bright sun,or just get tanned while sipping your favourite choice. The bar offers all of cocktails and drinks, hot and cold beverages, snacks and a light buffet. It is simply the most favourite place next to the pool! Open every day: 11:00 to 18:00. With comfortable seats and chairs, the Bar hall is the ideal place to meet and enjoy; its delicious list of cocktails and drinks and the night shows make this bar a great place to enjoy a fun evening! VILLA TAGORO offers a variety of services and facilities to meet desires, motivations and needs, as spending a happy family holiday is part of an unforgettable dream! - A daily free bus service to the nearest beaches and centre; every hour, except Sundays.